This app was designed to be very simple, so we do not have a large help file. its purpose is to display the particular company profile page of LinkedIn. Users can check their LinkedIn company page by adding ShareIn App Part in a page. You need to make your page in edit/design mode then in the ribbon ,click on Insert tab. 3. Insert "ShareIn" on any page, you would like to display the company profile page. 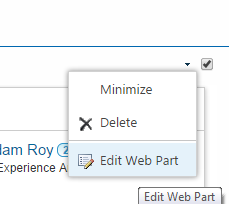 Next, click the "Edit Web Part" menu item to configure the App part. 4. You will get app part configuration menu in right side. 5. Now click on ShareIn App Part Category,you will see the Company ID configuration property. There you can provide your company ID of LinkedIn Profile. 6. Click on "OK" and Save the page. you will get the ShareIn App Part in your page.